In this post you will learn How to Get UAN Number in different ways. UAN Number is a unique number assigned to every epf subscriber to avoid multiple accounts for single subscriber. In order to avail these EPF services such as withdrawal, Pf Balance Check, transfer of pf balance etc., can be performed online. To perform all these tasks you need to know UAN number. Usually your employer intimate your UAN number for your reference. You are here to know your uan number. So, i assume you are have no option to know it from your employer. Lets learn how to find UAN number in different ways. There are few options to know your UAN number. If you have any of the following particulars, you can find your UAN number easily. I will explain how to find your UAN number from pf number/ member id using epf online portal. If you select member id, you need to select state and epfo office that your employer comes under. Based upon the options you choose, 1st two boxed will be filled. 3rd box is Est Code which is 7 digit code. 4th box is ‘Est Ext’ which is a 3 digit number. 5th box is Member id which is 7 digit code. After that you need to enter following details. Enter mobile number registered with epf. Enter your email id. It is not mandatory and then enter captcha. You don’t need to enter Aadhar and PAN number if you choose member id. If you don’t have member id, you can choose to find uan number from pan number. For this you need to select PAN option instead of Member ID and enter remaining details as explained above. On this same page, you have a option to know UAN number with aadhar number. For this you have to choose aadhar option and ignore member id and pan number options. The other details are mandatory. After filling required fields, click on ‘Get Authorization Pin’. Step 4: Once click get authorization pin, you will get an sms containing OTP to your mobile number. You need to enter OTP on the page. Once you enter otp, a message will be displayed saying “Your UAN and UAN Status sent to your registered mobile number”. Check your mobile for sms containing UAN Number and its status. This how to know uan number from pf number, pan number and aadhar number using epf online portal. You can also find UAN Number by giving a missed call. You can find UAN number by giving missed call from your registered mobile number. For this purpose, you or your employer must have activated UAN number. If you have activated UAN for the PF account number, you can simply give a missed call to UAN Missed Call Number: 011-22901406. EPFO will send you an SMS with UAN Number, Balance & Last Deposited Amount details. If you lost your mobile number registered with epf, this option will not work. If give missed call from unregistered mobile number, you will get reply message as ‘Mobile no 73823xxxxx is not registered with any UAN. This is how you can find uan number by giving missed call. You can also find UAN Number from salary slip. in private sector and public sector employers mention the UAN number in salary slip. Please do check it once to find UAN Number. If you have any problems to get UAN number, please comment below. I will try to help you. Once you get UAN Number, you need to Activate UAN Number. Read that post to learn UAN Activation Process. This is the end of main topic. I would also like to write about UAN portal features for enthusiasts. Continue reading if you are interested. Otherwise skip this section and comment below. UAN number stands for Universal Account Number. It is a 12 digit unique number for every individual. Even if you switch jobs, you must quote old UAN number. So that your old provident fund and pension amount will be carry forwarded and the new contributions will be added to old UAN Number. UAN helps EPFO in tracking the change in the job of the employee. It is done by matching KYC information such as PAN number, Aadhar number, date of birth. UAN allows balance transfer very easy when you change job. If you activate UAN, you can easily know EPF balance and access epf passbook which contains Pf Contribution of Employee and Employer along with interest credited annually. UAN allows epf subscribers to access facilities like withdrawals and transfers easy even when one changes his job. If you link aadhar with UAN, you can withdraw EPF balance without the employer’s signature. UAN member portal has many facilities. You can avail following facilities from UAN online portal. check out your EPF passbook, You can upload the Adhaar and KYC documents. 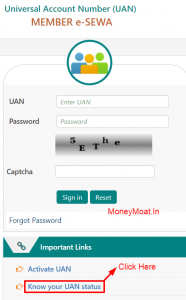 You can also link your previous EPF account number through the UAN portal. The UAN activation is also done through this portal. Can view PF passbook with contribution particulars of both employer and employee and the credited to provident fund and pension fund along with interest credited annually. This is all about UAN Number and its benefits. You will also find UAN Password Reset article helpful if you lost UAN Password. Do comment below to contact me for any information.